Farmers and ranchers are in a unique position to help address climate change. Using practices like conservation tillage and forage management, farmers can help the soil they work and plants they grow take greenhouse gasses out of the atmosphere, preventing them from interfering with the weather patterns upon which we rely. 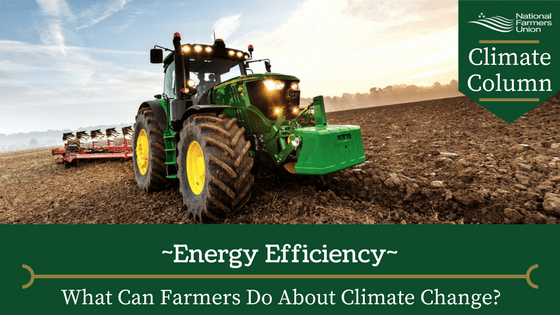 But farmers can also mitigate climate change the same ways other businesses do, like reducing the amount of energy used on the farm. Many farms are equipment- and structure-intensive operations. Electricity and fuel make up a significant portion of the cost of agricultural production. As the U.S. Department of Agriculture’s (USDA) Sustainable Agriculture Research & Education program (SARE) points out in “Clean Energy Farming: Cutting Costs, Improving Efficiencies, Harnessing Renewables,” farmers can cut down on these costs in several ways. Diligent tractor and equipment maintenance may be a great place to start: properly inflated tires and clean engines will save farmers money at the pump and reduce carbon dioxide emissions from unnecessary fuel use. Loss of efficiency from clogged filters, slack belts, and other maintenance issues can add up quickly. Farm buildings are another place farmers can look to reduce emissions linked to the farm. Upgrading light bulbs from incandescent models might be costlier upfront, but will save electricity in the long run. And when siting and constructing new buildings on the farm, farmers should consider the use and placement of windows to conserve power used for lighting and heating. Investing in insulation is another important way to manage these costs. Farmers and ranchers have many other energy costs, depending on the agricultural products they produce and the nature of the land they work, that might benefit from more specific products and practices, like irrigation or milk-cooling equipment for dairies. But equipment maintenance and energy efficient buildings are ideas that all producers, like most other non-farming businesses, can keep in mind to reduce costs and curb greenhouse gas emissions.